The power cut out sometime in the middle of the night, so the casa particuliares was without power when I woke up. I ventured out for breakfast at around 9 am, and the grand plan for the day was to travel to the other side of Havana to Casa Blanca station for the Hershey tram. The morning started off auspiciously enough: I walked by the Malecon, turned up the Prado, and headed down to Obispo for the ubiquitous tourist cafes (I needed to break a $20), and ended up at the café portion of La Mina, initially attracted by the prospect of French Toast for 0.70 CUC. Well, they didn’t have that, and their espresso machine was still broken from yesterday, so I wound up with a chocolate custard (0.70 CUC) and an orange soda (1.50 CUC). Also, along the way, I discovered that my DSLR died. Bummer. Iphoneography time. 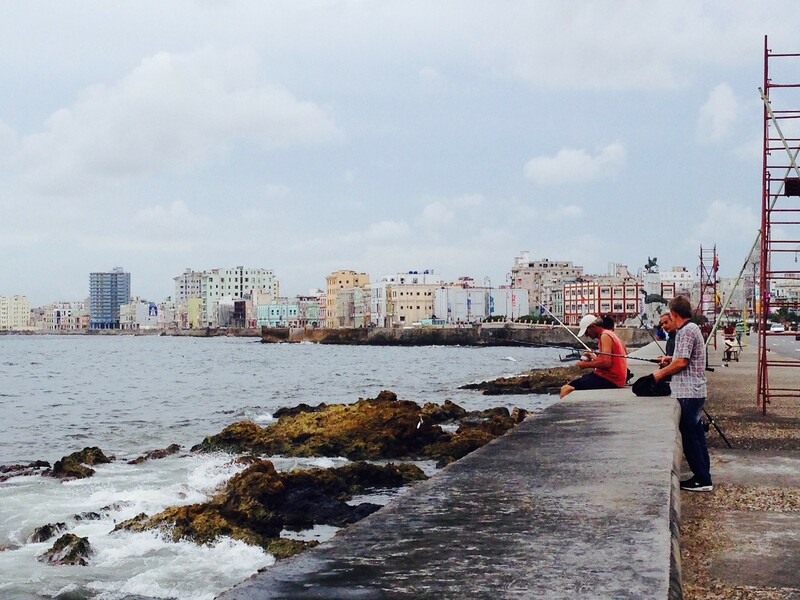 After getting some change for my 20 CUC, I walked towards the malecon in search of the ferry terminal for the crossing to the other side of Havana. Well, after walking up and down the malecon for a bit, I couldn’t find the ferry terminal. Bummer! Plans busted, I just decided to head back to town for more café con leche. I walked up O’Reilly this time, and spotted Café O’Reilly on 203 O’Reilly. It is a nice little coffee spot with affordable coffee. They roast their beans on premise, and also sell coffee by the pound. If you are feeling peckish, they also offer sandwiches, ranging from butter (0.50 CUC) to sandwiches with the works (ham, chorizo, cheese, etc., 4 CUC). As far as coffees go, they also offer quite a range, from your basis espresso (1 CUC), to liqueur coffees (~3 CUC) to iced coffees (~2.50 CUC). They do serve quite a full range of drinks, so your usual water, soda, cocktails. 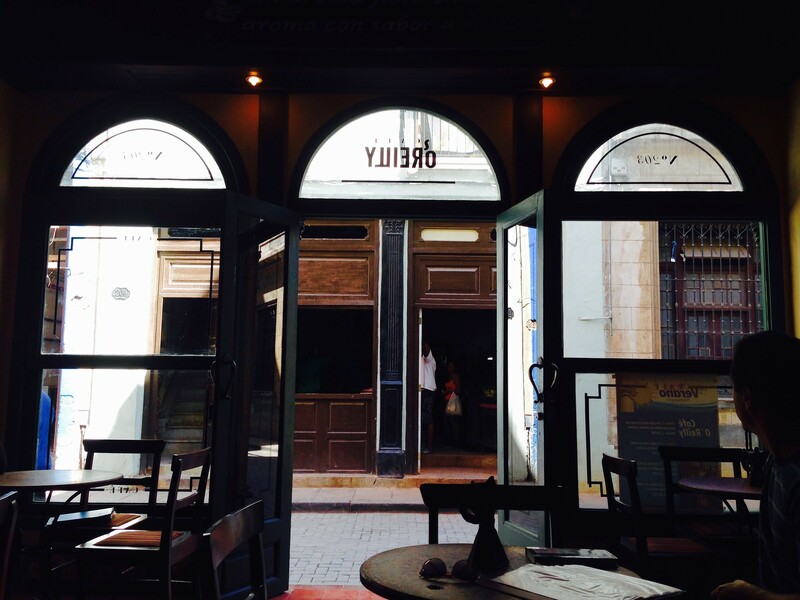 So far, this appears to one of the few establishments that serve iced coffee – something to consider in the Cuban heat. Some of the iced coffees sound suspiciously like frappuccinos. I wound up with a couple of café con leches (1.25 CUC). By around 1 pm, I was ready for some substantial food. 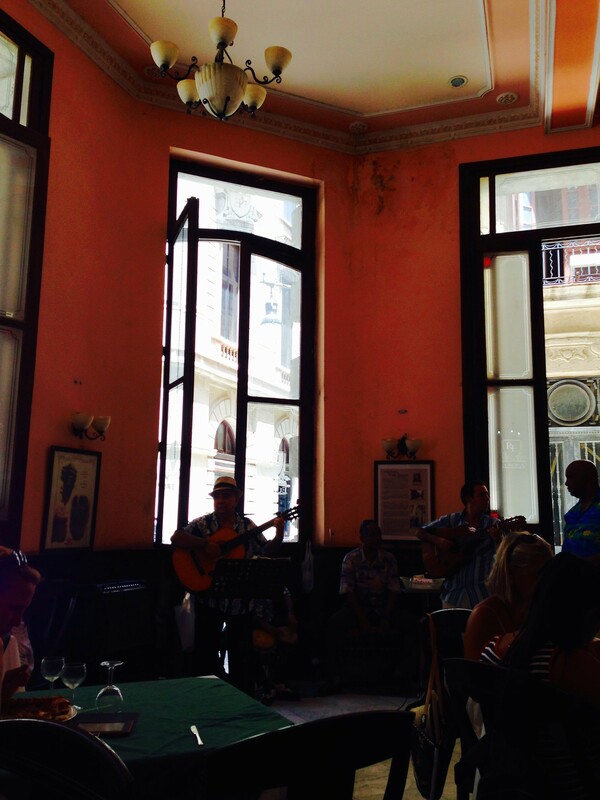 After walking around Obispo and surveying my options, I wound up at Europa, a cheap tourist café with a live band, and live dancing. It is a very cheap option, but you get what you pay for (i.e. the food is so-so). I had a grilled pork (3 CUC) with a side of rice and beans (0.45 CUC) and water (0.85 CUC). It is a very busy place, so I assume that the food is all pre-made, and they simply roll them out to diners as they come in. My pork chops were lukewarm, as were my rice and beans. They tasted ok, but I would have preferred it if my food were hot. Nevertheless, it is hard to argue with a meal that costs 4.30 CUC in total, with live music and dancing in the background. Service is rather slow, because it does get very busy. 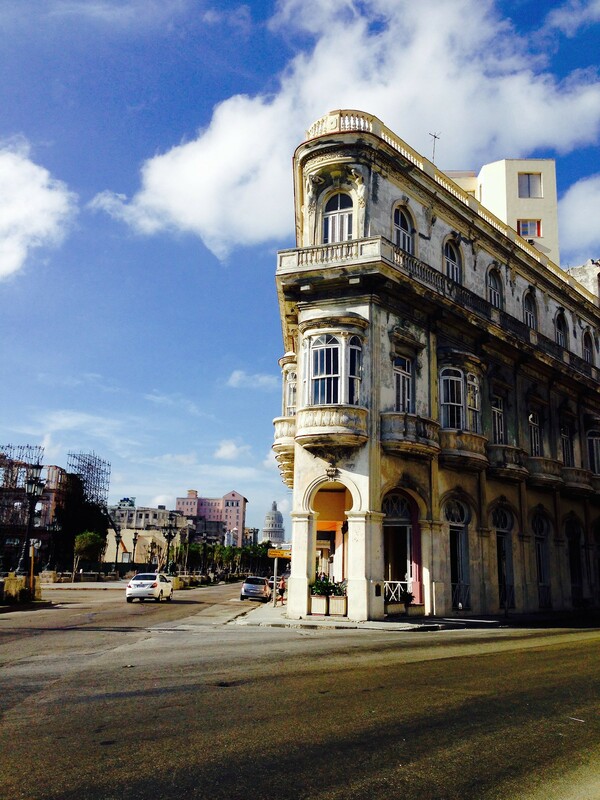 In the evening, tourist-shamed by the guesthouse staff (for wanting to sit around and read), I dragged my blistered feet to Vedado, the fancy part of Havana, where there are fancier hotels, like the Hotel Nacional (where celebrities stay), Hotel Havana Libre. Basically, the high-rise hotels. It is a nice stroll from the guesthouse on the Malecon, probably about 15 minutes or so. There is another wifi park on that street, quite a surreal picture, as you see people sitting on the streets with their laptops and cellphones, trying to get connected. After walking around some, and not quite wanting to shell out at the fancy hotels for a cocktail, I turned back on the Malecon. The Malecon on a Saturday is quite a nice spot. Families, couples, individuals are just hanging out. Some are fishing, some are just enjoying each other’s company. There are also many little pockets of public space, where street performers set up shop, and play music, put up magic shows for the public. Some of the installation art on the Malecon is also quite interesting – the one beside my guesthouse is actually a slide for kids as well. It’s quite a nice stroll, and a nice spot for people watching.